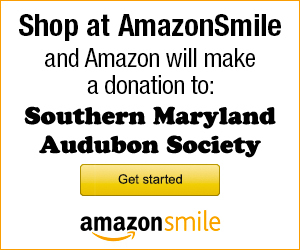 The Southern Maryland Audubon Society is committed to the National Audubon Society’s mission to conserve and restore natural ecosystems. SMAS works to further the mission through our concentrated efforts in Raptor Conservation, educational field trips and lecture programs, educational scholarships to Audubon’s education camp in Hog Island, Maine and local conservation advocacy support. Your dues to the National Audubon Society automatically enroll you as a member of SMAS. If you are a new member to National Audubon we receive 100% of your donation. You will also receive six issues of National’s award winning Audubon Magazine. SMAS will receive a portion of your subsequent renewal fees. Your dues directly to the Southern Maryland Audubon Society enable our local chapter to receive 100% of your membership fees. This local chapter membership will help us to achieve our backyard mission goals. Please click HERE. A pdf file will open in a new window for printing of our membership application in the Southern Maryland Audubon Society or National Audubon Society.